After attending the Wisconsin Entrepreneurial Bootcamp, former UW—Madison researcher Ankit Agarwal founded Imbed Biosciences to develop and market an innovative wound care product. Early in his studies, Ankit Agarwal had to make a choice between engineering and medicine. He chose engineering but eventually found a third way, one that puts him in a position to help more people than he ever imagined he could. Agarwal became an entrepreneur, a path he discovered by attending the Wisconsin Entrepreneurial Bootcamp (WEB), an annual weeklong intensive program for UW‒Madison graduate students in STEM fields. Now the scientist with a startup is bringing to market a product that could revolutionize wound treatment. 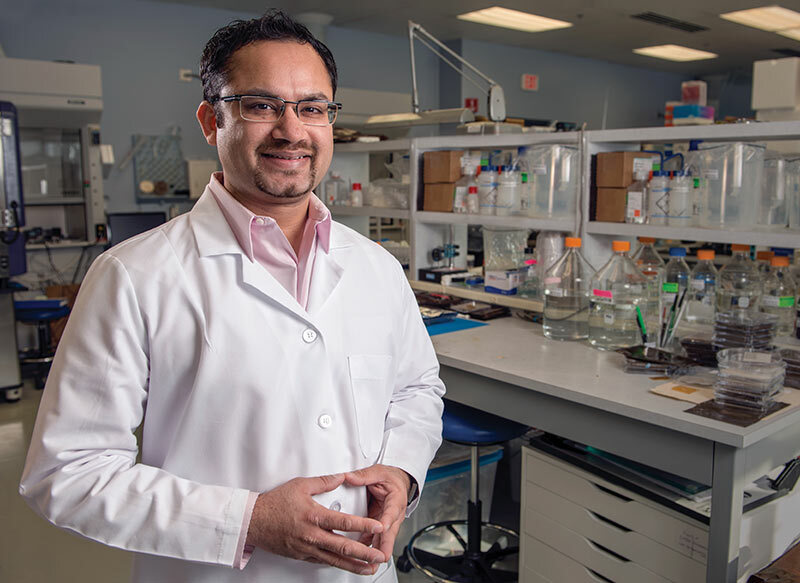 Agarwal is founder and CEO of Imbed Biosciences in Fitchburg, Wisconsin, which in August 2016 earned FDA clearance for human use of its bacteria-killing wound dressing. What began as research in a UW—Madison chemical and biological engineering lab has now entered the $6.3 billion global wound dressing market with the mission of bringing relief to patients suffering from burns as well as severe or chronic wounds. 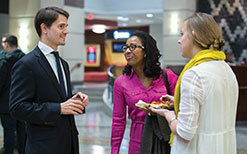 WEB, which celebrated its 10th anniversary in 2016, is an immersion program in which students assess opportunities based on their work and research. The intensive week provides a practical how-to in making the leap from idea to startup. WEB was co-founded by John Morgridge, chairman emeritus of Cisco Systems, and he continues to be instrumental in its success. 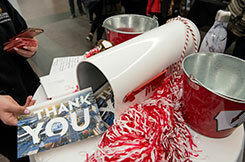 In 10 years, WEB alumni have started nearly 40 businesses and raised more than $21 million in investment capital. 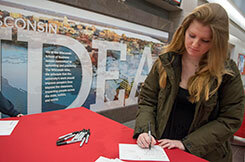 Thanks to generous support from John (BBA ’55) and Tashia (BSE ’55) Morgridge, the Wisconsin School of Business and others, nearly 600 students have gone through the program at no cost. Microlyte®, the product that launched Imbed Biosciences, is a thin dressing that improves treatment for patients with severe or chronic wounds. Some students, like Agarwal, come to WEB with a flicker of a startup idea. More often, they are researchers with a burgeoning entrepreneurial spirit exploring what might come next. 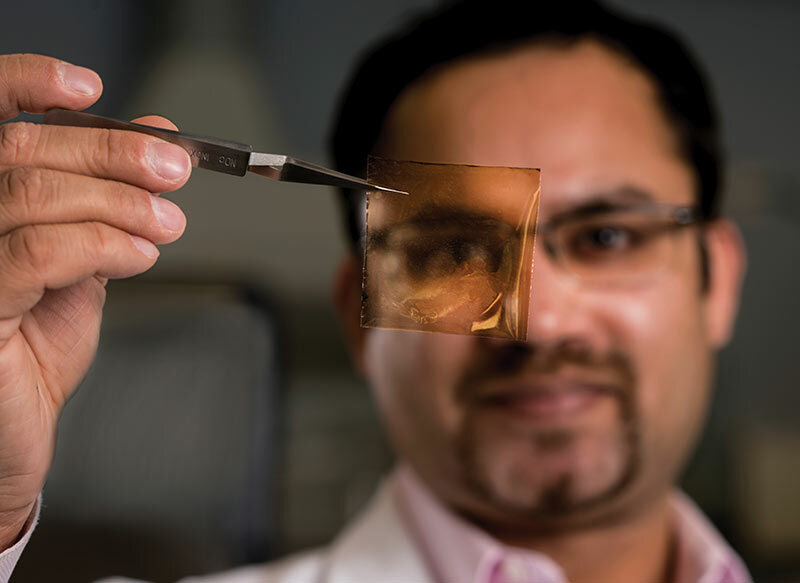 Agarwal came to UW—Madison for his postdoctoral research in the chemical and biological engineering laboratory of Dr. Nicholas Abbott, with a goal of engineering a medical device. “I thought instead of helping one patient at a time as a doctor, I could help many patients by making one good device,” he says. Agarwal sought inspiration for a device by attending seminars to hear physicians talk about their clinical needs. He learned from trauma surgeon Michael Schurr, who was then at UW Hospital, about the painful protocol of dressing a wound, drizzling it with anti-bacterial solution and removing and replacing it to prevent infection. The standard of care with large burns on children, for example, has been to do this twice a day. Schurr, now at Mission Hospitals in Asheville, N.C., wanted a better way. He sought a dressing that could hold off infection longer to help ease the patient’s pain as well as potentially decrease staffing requirements and hospitalization. In today’s world, often it’s not a single discipline that provides the solution. It’s multiple disciplines interacting with each other to come up with a solution. 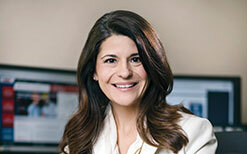 Agarwal and the team at the Abbott lab created a solution. Using technology developed for reflective window coatings, they designed an ultra-thin film coated with nanoparticles of bacteria-killing silver that can adhere to a wound. The thin film can get into the contours of a wound and ward off infection there. It degrades and sloughs off, so it only has to be reapplied, not painfully removed from a wound. And, it lasts for three days. Agarwal came to WEB ready to create a prototype. 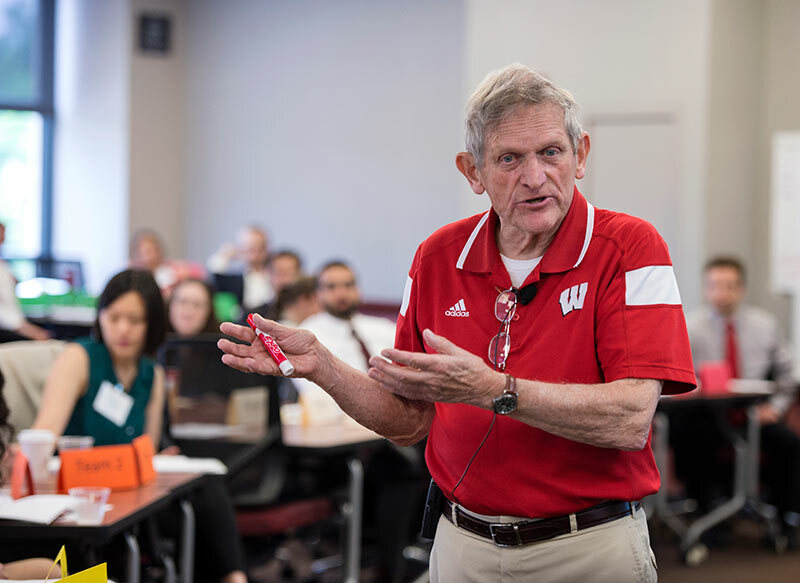 He and his WEB classmates learned about entrepreneurship through case studies, including one taught by John Morgridge. They also learned how to assess product ideas, secure funding, to network, and how to use startup resources from Madison to Silicon Valley. Agarwal kept going with his idea. 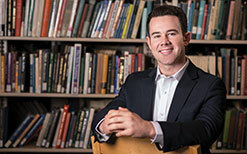 He won the Wisconsin School of Business’s business plan competition in 2010 and placed second in the Wisconsin Governor’s Business Plan Competition in 2011. He secured grants and, eventually, investors. In 2012 he left his research position and founded Imbed to develop the dressing, now named Microlyte®. Next for Imbed is finding partners with sales forces to bring Microlyte to the market, with a target of reaching wound care clinics first and then hospitals. Research is ongoing to apply the technology to deliver other molecules through the thin film. 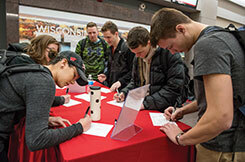 Agarwal knows to take charge of what comes next because of the jumpstart he got from the Wisconsin School of Business.